In August 2016, award-winning UAE activist Ahmed Mansoor was targeted with NSO Group’s Pegasus spyware. We clicked on the link he was sent and obtained three zero-day exploits for the Apple iPhone, as well as a copy of the Pegasus spyware. We fingerprinted the behaviour of the exploit link and C&C servers in the sample sent to Mansoor, and scanned the Internet for other matching front-end servers. We found 237 servers. After we clicked on the link, but before we published our findings on August 24, NSO Group had apparently taken down all of the Pegasus front-end servers we detected. In the weeks after our report, we noticed a small number of Pegasus front-end servers come back online, but the servers no longer matched our fingerprint. We developed a new fingerprint and began conducting regular Internet scans. We next sought to identify where these Pegasus systems were being used. We hypothesized that devices infected with Pegasus would regularly look up one or more of the domain names for the operator’s Pegasus front-end servers using their ISP’s DNS servers. We regularly probed tens of thousands of ISP DNS caches around the world via DNS forwarders looking for the Pegasus domain names (Section 3). Twelve of the servers that were shut down before we published Million Dollar Dissident (we call these Version 2 servers) were back online in a September 25, 2016 scan and stayed online mostly continuously until an August 10, 2017 scan. These may have been C&C servers for clients that wished to continue monitoring old infections. We saw the first Version 3 server in a September 5, 2017 scan, less than two weeks after Million Dollar Dissident. Approximately one month after Million Dollar Dissident, we saw what appeared to be seven operators online. Two months after our report, we saw 14 operators online. At the time of our June 2017 Reckless Exploit report about the abuse of NSO Group’s Pegasus spyware in Mexico, there were four operators using domain names that suggested a link to Mexico: RECKLESS-1, RECKLESS-2, PRICKLYPEAR, and AGUILAREAL. RECKLESS-1 and RECKLESS-2 employed some domain names containing political themes (RECKLESS-1 used universopolitico[. ]net and animal-politico[. ]com; RECKLESS-2 used noticiaspoliticos[. ]com and politicoportales[.]org). Operators RECKLESS-1 and RECKLESS-2 are so named because they were swiftly and completely shut down following publication of our report. Operators PRICKLYPEAR and AGUILAREAL were partially shut down: two or three servers for each remained online. One month after publication, in July 2017, the first domain names for a new operator, MAYBERECKLESS, that would focus on Mexico were registered. The MAYBERECKLESS domains began matching our fingerprint in September 2017. MAYBERECKLESS may be a continuation of RECKLESS-1 or RECKLESS-2. Also in September 2017, the remaining servers from PRICKLYPEAR and AGUILAREAL were supplemented with new servers. We identified five operators that we believe are focusing on Africa. One operator that we call REDLIONS uses frontend domains that appear to be almost exclusively written in the French language, including two politically themed domains (politiques-infos[. ]info and nouveau-president[.]com). We found DNS cache probing hits for REDLIONS in Togo. Because we did not perform our DNS cache probing study until July 2018, we did not have the opportunity to probe one operator, AK47, which shut down in July 2017. Operators ATLAS and GRANDLACS also made use of politically themed domains (ATLAS used revolution-news[. ]co and GRANDLACS used politicalpress[.]org). Firstly, we considered the possibility that users might incur costs or service disruption as a result of our DNS Cache Probing. We believe that this is a highly unlikely outcome, given the small number of requests made during the activity. As deployed, the technique results in fewer than one request per second per IP address, and thus is less than one kilobyte per second. The total traffic is thus less than 100 megabytes per day. To further minimize load on the authoritative name servers for the domains that we are probing, we use nonrecursive queries only. As a result, we do not anticipate costs incurred by users, or bandwidth degradation. 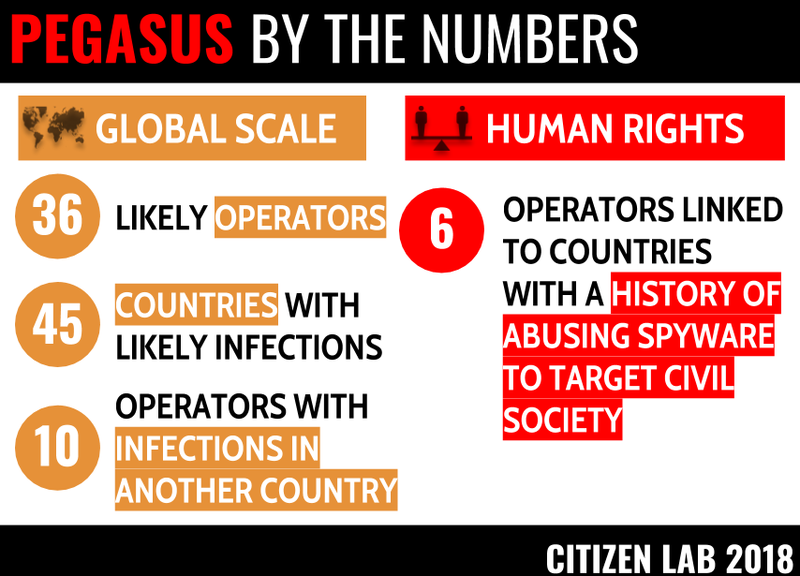 Our mental model of deployment of the Pegasus spyware is that most operators have two C&C servers to which most infections talk, and that the rest of their infrastructure comprises domains that are used in exploit links. After reports concerning the use of Pegasus spyware were published by Amnesty International and Citizen Lab on August 1, 2018, a staged shutdown of the Pegasus infrastructure was conducted over a period of several days. At first, the bulk of frontend domains appeared to be shut down, while a handful of final domains (usually two) remained active for each operator. We believe that these were the C&C servers and that the domains were kept online so that infected devices would have an opportunity to beacon back and receive instructions on new C&C servers with which they should communicate. Uno TV is a Mexican provider of news. The domain name unonoticias[. 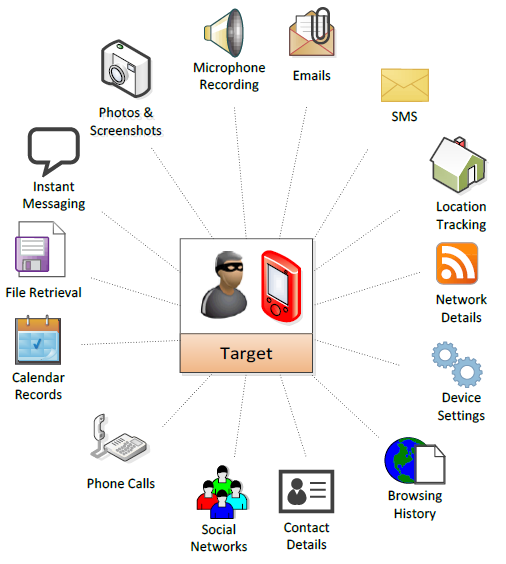 ]net was previously used to target Mexican journalists with Pegasus spyware. Table 36: Suspected infections for operator TULPAR.